One of the features of the Wizardry in Wood Exhibition put on by the Worshipful Company of Turners will be the display of turned and other wooden items from the Mary Rose Museum. This display is the first in the City of London from this fabulous collection which is opening its new gallery in the next few months in Portsmouth. 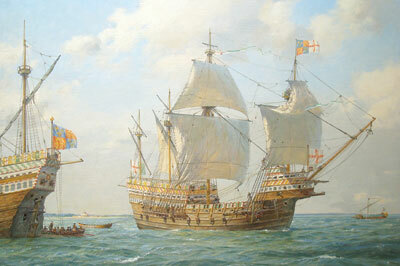 Henry VIII's flagship, the Mary Rose, had been newly equipped with the latest cannons when it was called into action against the French fleet in 1545. There are a number of theories as to why she suddenly sank in Portsmouth harbour and we shall probably never know. But sink she did and remained under the silt of the harbour until raised 30 years ago in surely one of the most remarkable archaeological rescues ever. Wood was, of course, one of the most useable materials of 450 years ago and the sands provided a unique 'time capsule' of not only the hull - or half of it - but much of the ship's equipment and every day utensils. The condition of the items that have been excavated is extraordinary, particularly when compared with similar items that have been preserved in our stately homes, for example. The latter have been attacked by the atmosphere and in many cases have rotted or crumbled away. When one asks to see medieval long-bows which won the battle of Crecy, for example, they just do not exist, whereas the Mary Rose has box after box of them in pristine condition. What is surprising is the extent that these items were actually turned on a lathe. Just some of these from the overall collection are planned to be shown at Wizardry in Wood and are described below. In addition there will be demonstrations of how they would have been turned in 1545, by Robin Wood, who has made a special study of these artefacts. 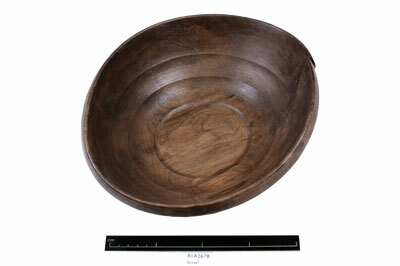 Wooden bowls were the every day utensil of the sailors used for drinking as well as eating, and it is fascinating to see the form of these so similar to our own turning today. They were obviously turned on a pole lathe with its reversal of direction as can be seen by close examination of the rougher underside. They were also of relative value and there are examples of where a split has been repaired whereas we today would throw them away. 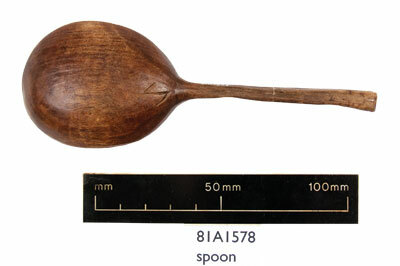 The marks of the owner have been on occasion scratched into them with a corresponding spoon, albeit carved in this case. 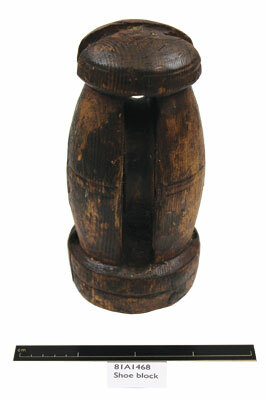 The equipment of the ship included a profusion of different sized turned wooden pulleys most often in carved sheaves, but on occasion these were also turned as was the spindle. Interestingly the original hemp ropes also exist in quantity and appear - and smell - to be but just a few years old. For the cannons the ram-rods were all turned as were the capping pieces to keep the sea water out. An ornamentally turned linstock to fire a cannon even has the original scorch marks where it lit the fuse. 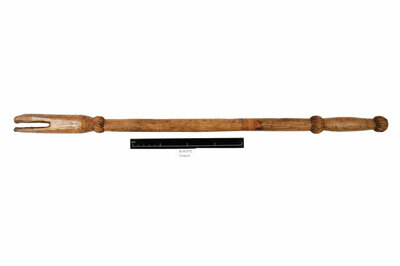 Military weapons are represented in profusion particularly with turned wood handles, such as daggers, although the steelwork has in most cases rusted away. 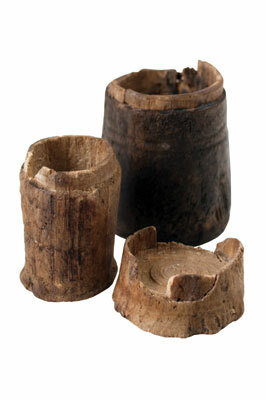 Medical equipment was often in turned wood and there are examples of ointment jars and syringes from the ship's surgeon's area. 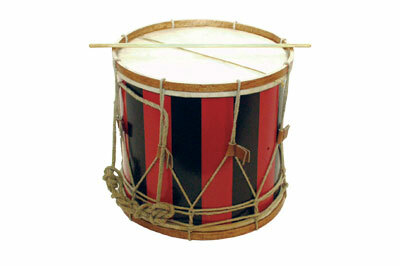 The ship had its own band and wooden instruments include the shrill double-reed shawm of unusual design and the pipe played with the tabor (drum). 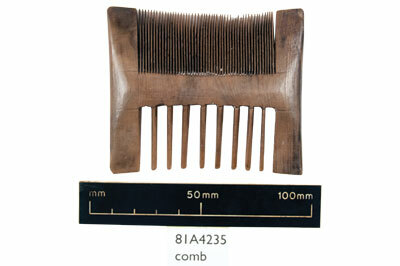 Personal possessions of the sailors include such items as nit-combs - complete with nits - rosary beads, mirror holders -the list goes on and on. 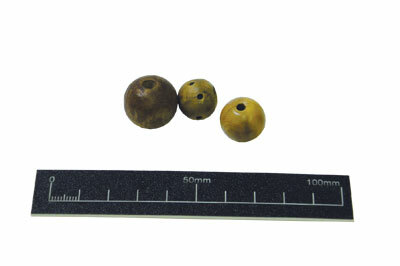 These artefacts would have been turned 'on dry land', of course, but it begs the question as to whether the Mary Rose had a lathe on board as a maintenance tool. There were certainly lots of carpenters' tools on board looking uncannily like today's tools. But they have not found a lathe - yet.